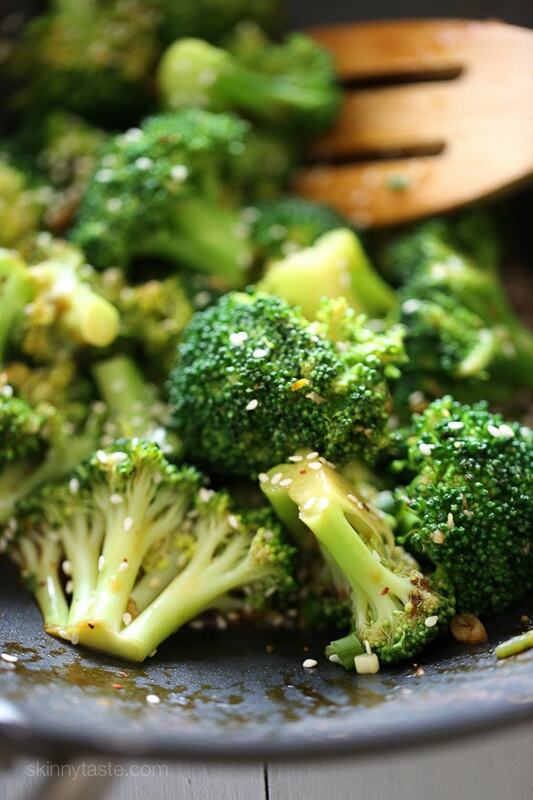 Looking for something different to do with broccoli, then this easy side dish is for you. Perfect side with salmon, cod, chicken or steak. You could even make this a meal by sauteed this with strips of beef or chicken before making the broccoli! Add broccoli and boil for 1 minutes. 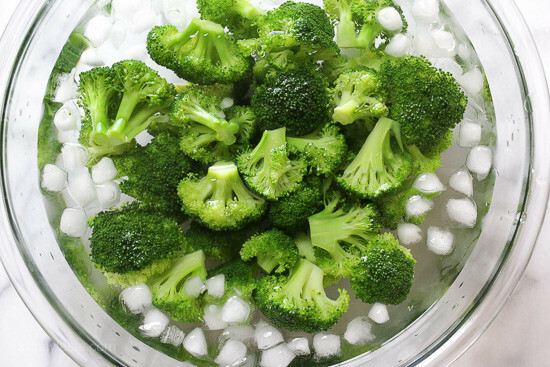 Drain and immediately place broccoli in a large bowl of ice water to stop it from cooking. In a small bowl add orange juice, soy sauce, orange zest and cornstarch, whisking until cornstarch is dissolved. Heat a non-stick wok or large deep skillet over high heat. Add sesame oil, scallions, garlic and ginger and sauté for 30 seconds. Add the sauce and broccoli and sauté 1 to 2 minutes, until the broccoli is crisp tender. Sprinkle with sesame seeds and red pepper flakes (if using). I just made this tonight and thought it was EXCELLENT! The broccoli was cooked and sauced to perfection. Gina, my girlfriend and I started WW a couple months ago and I think I’ve honestly made at least 30 of your recipes. They are ALL delicious, and I’ve lost twenty pounds. I just wanted to tell you that the time you take with this blog has made a real positive difference in my life; thank you! Made this for Mother’s Day and the bowl was empty! 20 minutes in the oven at 375 (convect) made the broccoli perfect. I mixed up the sauce and didn’t bother to dirty another pan – just tossed it all in a bowl and served! Really nice hint of sweet from the orange, and Asian flair from the sesame oil. 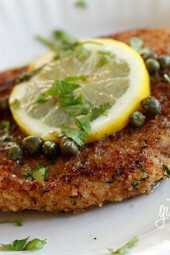 I’m making this tonight and definitely looking forward to it. Can you tell me if there is still a way to save a PDF of a recipe after your website got a facelift? 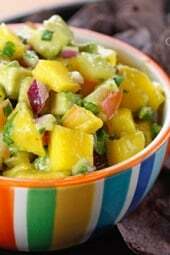 I save all my recipes in my Google Drive so I can access them anywhere I am (store or on vacation) and includes all my scanned in recipes from generations of family. I was able to do this easily prior to the website update which I believe was from the print area but I am not having any luck with it now. Thoughts? Thanks AND love all your recipes! What can I use in replacement for corn starch? Arrowroot is a good thickened. Whole 30 friendly if I remember correctly. Another huge hit at my house! I made it into Orange Chicken and Broccoli by doubling the sauce and adding cut up chicken breasts and onion wedges. So delicious and lighter/tastier than greasy takeout. Thank you Gina! Made this tonight for supper and it was delicious! Trying to eat healthier but the same old stuff gets boring. Thanks for the recipe! I'm looking forward to this! I'm slightly anemic and have been adding iron rich foods to my diet. I was surprised to find sesame seeds to be a good source of iron. What I am impressed with Gina, is that you need to combine iron with vitamin C for full absorption! That's what I noticed about this awesome recipe! Thank you so much for being Gina! I've been a huge fan for years! I made this tonight with broccoli and sautéed eggplant – omg! Amazing. Thank you for always being a meal inspiration. This recipe sounds so good! Looks pretty too! Keep fresh ginger in the freezer. When needed grate into your recipe. No need to peel. Wash ginger root before freezing. Ginger will keep for a very long time this way. Can you use the powder form of ginger rather than fresh (I never have fresh ginger on hand)and if so how much should I use? It won't taste as good. I buy a small piece of ginger and keep it in my freezer! It lasts a while and it grates easy frozen. Wow…great tip. I never thought of keeping it in the freezer! Thanks! Julie – what temp did you use and for how long? Thanks! What temp and for how long should the broccoli be roasted? 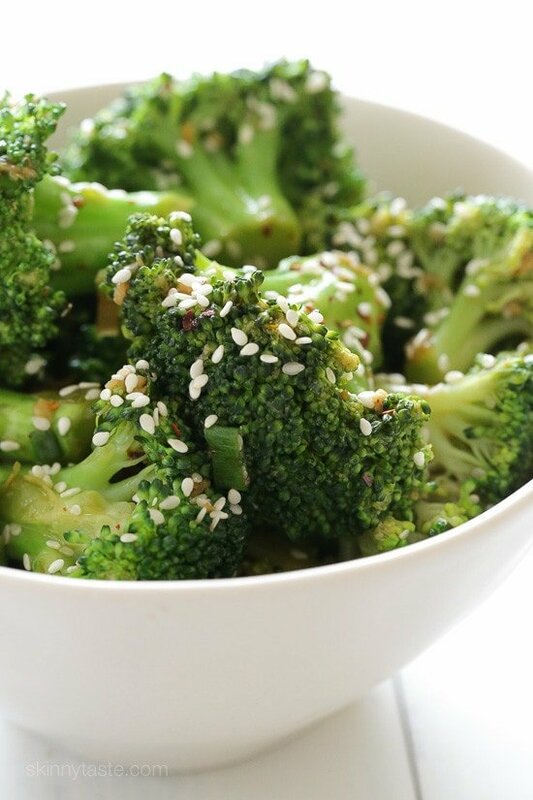 This actually looks like an amazing recipe for broccoli. Everyone knows that I'm not fond of steamed/overcooked broccoli, and it's hard finding something that I'll really like, let alone my fiancé and housemate. Shall be adding this recipe to the meal plan for next week, perhaps with some crispy tofu and egg noodles. 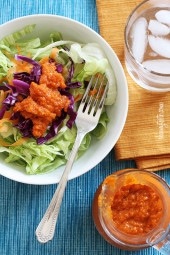 Have you tried cooking this with other veggies too, such as cauliflower or capsicum? It would be great with cauliflower too! Yes! I can't wait to try this! I'm going to make this using extra firm tofu. I've gotten so sick of plain steamed broccoli. I'll have to try this!